In this book, J.J. Clarke shows us how Taoist texts, ideas, and practices have been assimilated within a whole range of Western ideas and agendas. We see how Chinese thinkers such as Lao-tzu and Chuang tzu, along with practices such as Feng Shui and Tai Chi, have been used as a key Western inspiration in religion, philosophy, ethics, politics, ecology and health. The Tao of the West not only provides a fascinating introduction to Taoism, it also offers a timely insight into the history of the West's encounter with this ancient tradition, and into the issues arising from inter-cultural dialogue. Anyone interested in understanding the key influence Taoism has had on the West will welcome and embrace this book. Start reading The Tao of the West on your Kindle in under a minute. J.J Clarke has taught philosophy at McGill University, Montreal, and at the University of Singapore, and is currently Reader in History of Ideas at Kingston University, UK. He is the author of In Search of Jung, Jung and Eastern Thought, and Oriental Enlightenment: The Encounter Between Asian and Western Thought, all published by Routledge. Daoism has been presented in the West in so many ways: from the mythologic/folkloric (see esp. EJ Girardot) to the philosophic (esp. Chad Hansen) to practices such as Tai Chi and Chinese medicine (see your Yellow Pages). 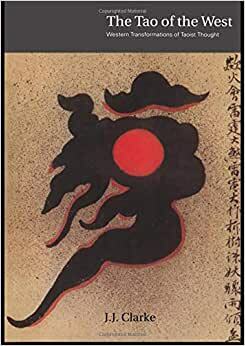 This book is a wide ranging exploration of how Daoism may stimulate meanings and perspectives in science, ethics, spirituality, politics, the arts, philosophy and health. Clarke's book allows the Western reader to better contact Daoism by an awareness of the contexts in which we read and experience Daoist texts and practices. He shows how we may misinterpret, misapply, sometimes just miss what the Daoist tradition offers because of assumptions and perceptions from Western history and theory, as well as differences in language. His aim is not so much to correct distortions as to appreciate cultural and philosophic differences as essential to scholarly and personal experience and meaning. He hopes that we encounter Daoism (or any Other we may want to understand) through a continuing dialogue "in which meaning is a function of the interaction between the two." He doesn't advocate a better Eastern Way for the West. What I believe he'd anticipate from the interaction is the kind of spontaneous and unpredictable re-constituting effects upon each of the traditions as has been observed from the vantage of chaos theory and the Daoist hun dun. Clarke questions the "ism" of Daoism. He persuasively argues it developed differently from the Western tradition of wars or antagonisms among religious sects or doctrines, that it fluidly interacted with Confucianism and Buddhism in China. -Acceptance of the body: Contrasting the body's renunciation in much of the Buddhist and Christian traditions, Daoism places the body at the center of it all. The book is accessible to the non-academic, but familiarity with 20th century currents in Western philosophy is almost necessary for parts of it. Though a scholar may find some historical or philosophical flaw, or someone may disagree over some of Clarke's explorations (e.g., of parallels in postmodernism), the benefits of his work shouldn't be missed. After more than a decade, the book still points to the potential of Daoism to catalyze creativity, meaning and ethics. Lest you think it's about archaic texts and art, see the art of Haegue Yang, whose current exhibition in Aspen (Haegue Yang) draws from Daoism. Her work is just the kind of unpredictable and inspired interaction Clarke would hope for. I have been reading Tao since 1958 and have read Chinese history. A history and critique of Tao as presented in Western contexts is well overdue and Clarke's contribution is a welcome start. As a start, he deserves the credit and sympathies accorded trailblazers but progress toward better work depends on the feedback from others. The 25- page bibliography is useful, even though there are many others that are longer, better, and focused only on philosophical Taoism. Clarke points out that French scholars were the first to take a serious scholarly interest in Taoism but it was not until 1870 that the first translation of the CT appeared (in German). An English translation did not appear until 1881. Western history has a pattern of such alternating valuations and denigrations of Taoism. All such positions tend not to be attempts to understand Taoism in its own terms; all tend to be attempts to interpret Taoism or to read Taoism selectively in order to relate it to Western philosophy and/or religion and/or science. There is no basis in Tao for such dichotomies, and Clarke, despite his intentions, does not avoid dualisms. Many Western writers try to show that the Taoist classics contain theories about topics considered important in Western philosophy and psychology. Some writers have been guilty of the most outrageous translations and interpretations of philosophical Taoist works, attempting to reduce Tao, for example, to the fundamentalist Christian God and philosophical Taoism to the other absurdities of conventional Christianity or of theism generally. The ambition of the Jesuit Matteo Ricci, the first to bring Taoism (but only the TTC) to Europe, was, of course, the advancement of Roman Catholicism in China through Confucianism. James Legge (1861), the pioneer translator, was a Protestant missionary. J.C.H. Wu (1963) translates and describes Tao in Christian terms, completely misunderstanding and distorting the Chuang Tzu. Blakney (1955) and Osho (2002) use the word `God' liberally in their distorted works on Tao. Lin Yutang (1948) distorts Tao badly in order to relate to Christianity. Some writers falsely translate Tao as `Heaven'. It is a persistent Western misunderstanding to talk about Taoism as a religious belief system with followers as in Christianity. The fact is that there are no churches to Tao, and many who accept philosophical Taoism are also atheists, agnostics, Buddhists or members of one or more other non-theistic religions. Until the modern era, the Chinese language did not even have a word for `religion.' There are some who reject or denigrate Taoism and for a variety of reasons that generally reflect Western or Christian assumptions, thus `Taoism is bad because it is not Christianity'. There are some who accept Taoism for the same reasons, thus `Taoism is so similar to Christianity that it is good.' There are others who argue from the perception of Western deficiencies or the projection of Western needs on to Taoism, e.g. `The West is sick and Tao is the corrective'. Some have misinterpreted the Taoist classics in other most ridiculous ways, e. g. Creel (1953), Hansen (1983), Knaul (1985), and, to some extent, Wing-sit Chan (1967) portray Chuang Tzu as a relativist and some, e.g. A. Cua, the later works of A. Graham (1983, 1969-1970), and D. Wong (1984) portray the master as a `soft relativist'. In my view, such critics do not understand the total text (Allinson 1989:112-115). The list of the distorters and their distortions would fill a very large book. Despite Clarke, there is no a priori justification for his rejection of Tao as potentially of universal applicability or relevance rather than just another philosophy (as is the obsessively relativist position of postmodernism). Apart from the bias of Western scholars, the ancient language of the text, textual ambiguity, and the complexity of the ideas make an understanding of the Taoist classics difficult. Paul Carus (1898) saw Taoism as a model of religious universalism and toleration. Joseph Needham (1952-1974), despite his Anglican religion, emphasized the basic incompatibility of Taoism and theism and argued that the basic anti-transcendental empirical, holistic, organicist mysticism of Taoism fostered the development of science and technology, a development that failed to mature in China for socio-economic, rather than philosophical reasons. At the same time, Taoism did not offer a mechanist view of the world and, in Newtonian days, would have been regarded as false, misleading, romantic or fanciful. With the advent of quantum mechanics and studies of ecology, Taoism gained favour (e.g. Capra, 1974) in the West but it is, of course, silly to claim that the ancient Taoists knew implicitly what quantum scientists have discovered and proven. The major weakness of Clarke's work is that he assumes and defends the dichotomies of organicism- mechanism, Enlightenment-Romanticism, and the like (e.g. see p. 193). He attacks Postmodernism for tending to lead to a view of the world as inherently banal and aimless that leads to despair rather than to wisdom. Chad Hansen, for example, approaches Taoism via differential approaches to discourse. His Taoism is `useful' in the critique of Western philosophy and is resonant with modern linguistic philosophy, but what does linguistic philosophy have to do with personal or spiritual development... especially when the Taoist classics specifically make the point that the Tao is not to be found or communicated exactly in words? And yet Clarke remains committed to Postmodernism and seeks to use Taoism in his language games about the alleged crisis in Western philosophy. Fundamentally, he is ignorant of the absolute non-duality of Taoism. For all his expressed concern about the evils of projecting Western concepts on to the Other (e.g. Taoism), he is blind to any other possible perspectives. He simply fails to take a position when it comes to evaluating Taoism or the Taoism in relation to language, science, cosmology, morality, politics, and personal transformation. Lacking a coherent understanding of Taoism, he retreats and returns to postmodernism. "In the first half of the twentieth century, where the influence of positivism meant that traditional religious systems from remote parts of the globe could conveniently be ignored, Daoism had little place. But in recent years the pendulum has swung in the opposite direction, and our times are marked by a retreat from the certainties sought by positivists, and a compensating emphasis in science, philosophy and literature on unpredictability, disorder, incommensurability and a suspicion of the truth-telling power of language. In the previous chapters, we have noted in various ways not only the importance of Chinese ideas in the emerging ecumenism of philosophical hermeneutics, but the relevance of this intercultural discourse to contemporary philosophical interest in issues concerning self, truth and gender identity, and of course in general to postmodern critiques of the Western Enlightenment project. The impact of Asian thought has long been felt, if only marginally, in the West's struggle with the nihilistic mood that arose both out of and in reaction to modernism. Earlier, it was Hinduism and Buddhism that entered into this dialectic. Now it is the turn fo Daoism, with its robust sense of finitude and its romantic healing of oue relationship with the natural and the ordinary, to help find a way beyond nihilism without having recourse to narratives of transcendence." (Clarke 2000:208). A sound history and evaluation of Taoism with respect to the West has yet to be written; the West, not to mention many Chinese scholars, have yet to understand Taoism, but I am buoyed by the progress that is being made in the journals. An intriguing feature of modern western culture has been its readiness to play fast and loose with the elements of Chinese religion without really understanding or caring how they fit together. From yin-yang coffee tables to 'the Tao of Pets', this cultural appropriation is ubiquitous. J.J. Clarke has given us a timely and excellent discussion of the interface between Taoist and Western religion and philosophy, which should not to be confused with 'A Gathering of Cranes : Bringing the Tao to the West', to which it is vastly superior. What is particularly interesting about Clarke's work is its willingness to set the philosophy of Taoism firmly alongside western philosophical thought, and to consider the implications of their meeting. He begins by quoting Nietszche: 'what is needed is... new philosophers', and goes on to suggest that some of this newness might in fact be provided by age-old Taoism. While this is an academic and scholarly work, its clarity and readibility is such that I would have no hesitation in recommending it to undergraduate students of religion, or indeed to the interested general reader. However, here is probably not the best place to begin an understanding of Taoism as such. For this I would recommend Martin Palmer's 'The Elements of Taoism' or Isabelle Robinet's 'Taoism, Growth of a Religion'.